A number of so-called experimental novels have painted dark pictures of societies’ future by also breaking with a number of previously established conventions of the novel. Often taking a comparative perspective, the contributions present facets of a fascinating literary history, which hinges on the following questions: How do/did Swahili authors construct their means of literary writing? How do the innovative style and the estranged fictional world of the writings relate to the recurrently underlined social commitment of the novel? Recent years have seen a renewed scholarly interest in utopian and/or dystopian literary writing more generally. 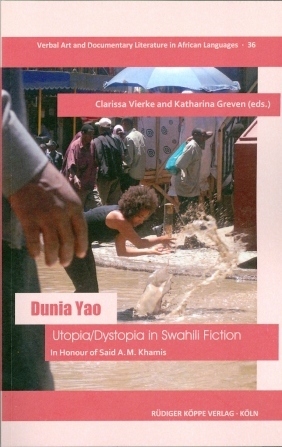 [...] The volume co-edited by Clarissa Vierke and Katharina Greven addresses a trend in Swahili literature and, most specifically, Swahili novels since the 1990s, which are often referred to as “new” or “experimental novels” and many of which resonate with aspects of utopian and/or dystopian writing. Dunia Yao, the 2006 novel by Said Ahmed Mohamed evoked in the volume’s title, represents, as the editors say, an “important example of the trend”, being set in a constructed, distant future world and offering “views on nightmarsh sceneries of devastation and chaos”. [...] All in all, the volume represents an important and valuable contribution to a growing body of book-length critical studies of topics in Swahili literary discourse. By focusing on more recent developments in Swahili literary history, it provides a fascinating perspective on aspects of, as well as critical discourse on, the aesthetics and sociocritical concerns of contemporary Swahili literature. This makes it relevant not only to scholars of Swahili literature but of African literatures more generally. [...] the volume fills a major gap, drawing attention to the perhaps obvious, but sometimes underestimated fact that African-language literatures partake of and creatively interact with global discourses and paradigms in multiple ways. In this respect, it enhances future comparative research.